One of my favourite decor shops in town to explore new pieces and discover fantastic antiques is Flik and Company in Leslieville. Describing their own style as where French meets Industrial with a twist of mid-century. I was excited to see their own home featured in a recent issue of Chatelaine, and especially to see their newly decorated rooms for their little ones (two of the most adorable children in the city!). Here's a peak inside their own bedroom (below) and (second down). Filled with vivid, saturated colour that is so refreshing and energizing against the cool white walls. No doubt an inspiring space to wake up to! 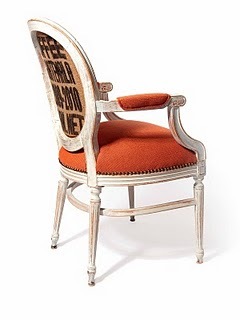 Here is one of the new pieces from Flik by Design's new collection a classic white Bergere chair upholstered with a coffee sac back and a bright orange tweed. A stunning new update on a classic piece, and a little unexpected. Perfect for an Hermes inspired autumn palette. Be sure to visit the new Flik by Design at 1360 Queen Street East in Toronto. i really like how it looks like the horse is sniffing the flowers in the first shot. Oh yes! And the horse makes me smile! So beautiful...love a splash of orange in any room!! I never knew orange could look so elegant against a backdrop of crisp, white heaven. Love it. orange is so beautiful against white--love it this time of year especially! DOC - haha, I didn't notice that at first but you're completely right. That's too cute! DB - horses always make me smile! Carpe Diem - agreed, orange doesn't rush to mind when I think of elegant, but here it completely is! 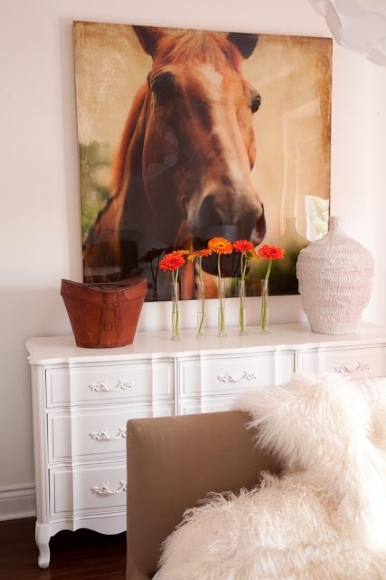 Horse art (especially large format) looks great! Loving the fresh and tangy colour palette too. That last chair has my name on it! Oh my! I love it! I will use it in my next post! (yes, with a link of course).